Guanxi means "relations", as in "Community Relations". It's also a very common word describing how to get things done in China. It even has its own English language Wikipedia entry. Yi-ling-yi means one-oh-one, as in Taipei 101. This number sequence also means "special" in Chinese. Taipei 101 is the world's highest completed skyscraper. Needless to say, that merits another Wikipedia entry, not to mention a blog entry in Traditional Chinese. Tomorrow, I'll make another attempt at giving a short MySQL speech in Mandarin. 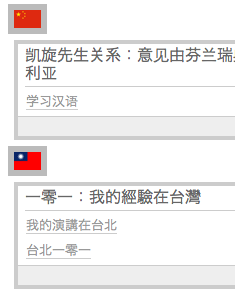 Well, technically speaking, it's already today, as it's 3:30am in Taipei. My internal clock has gone awry.